Found a cave in Manitoba? Tell us about it! Since its inception, the Speleological Society of Manitoba has produced two editions of its cave atlas, Caves & Karst In Manitoba's Interlake Region. The first edition came out in 1991, and the second in 2000. 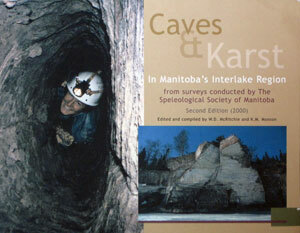 Caves & Karst in Manitoba's Interlake comprises surveys conducted by The Speleological Society of Manitoba. This expanded second edition, edited and compiled by W.D. McRitchie and K.M. Monson was published in 2000. Among other things it includes an explanation of how caves are formed and a discussion of some of the flora and fauna inside. The SSM also finds and surveys caves in Manitoba. From beginning to end, it tells the story of the caving movement in Manitoba starting with the very first field trip in 1987 when the St. George Lake Bat Cave was discovered - still the largest bat hibernaculum in the province. The book contains 84 surveys of the most important/impressive caves found in Manitoba. However, they are only a portion of more than 225 caves discovered so far. These caves have been organized into 3 major geographic areas; Grand Rapids Uplands, Lake St. Martin and the Southern Interlake. To find and survey the caves featured in this book, members of the SSM have investigated hundreds of square kilometres of Manitoba wilderness and invested thousands of volunteer hours.